Many of us have vivid memories of playing with building blocks as children. From Lego blocks to more obscure options like construx, these types of children’s toys spark something unique in our collective creative consciousnesses. Many of these types of blocks have interlocking edges that adjoin another block to create larger structures and even vehicles. 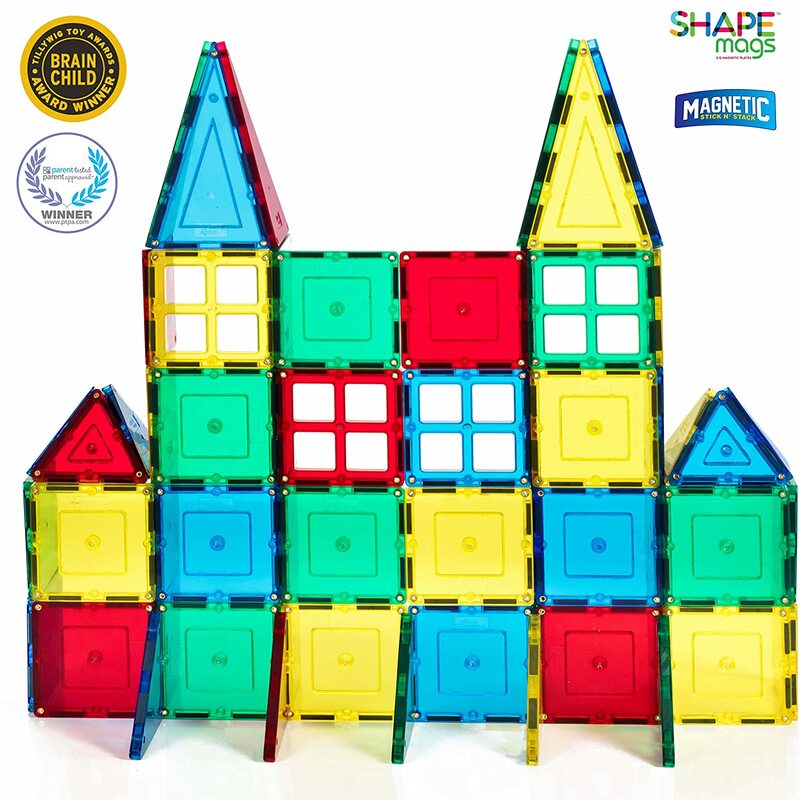 A recent trend in this genre of toy is the magnetically interlocking blocks that are typically semi-transparent and build complex thin-walled structures that incite the imagination. In recent times, this branch of building block has experienced something of a boom and there are now many varieties and brands of magnetic building blocks on the market. As many find the variability of choice daunting, we have collected a series of market-leading toys of this type so that your decision is made much easier. Picasso Tiles is a company that is dedicated to fun. It encourages young school-aged children to immerse themselves in the imaginative process to create interesting two dimensional works of art. They can also create unique three dimensional dinosaurs or trains if they have the right shaped pieces. Our gold pick, which is Picasso’s Clear 3D Magnetic Blocks, are a set of building materials that hold up to the quality standard that you associate with Picasso Tiles. These magnetic tiles are designed to help young school-aged children develop their minds through active and educational play. They are traditionally created for children who are three years of age or older, but they can also be played with by any young child who is in that important stage of development where it is recommended that they have a more hands-on learning experience. Creating expressive two dimensional designs and three dimensional masterpieces can give your child a sense of achievement as well as the chance to spend quality time with you. 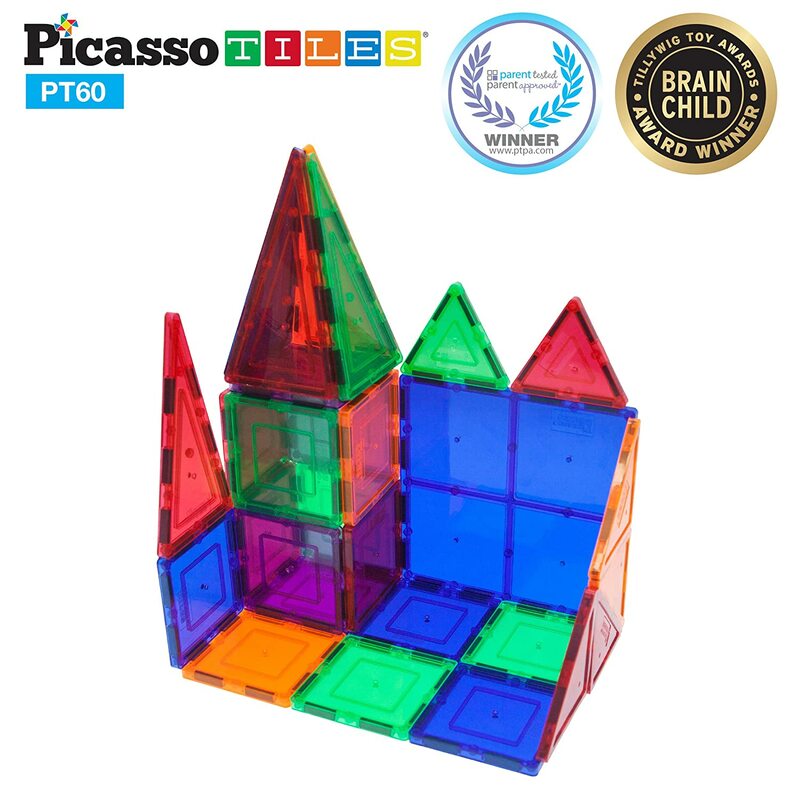 This Picasso building block set comes complete with 60 pieces that can be mixed together with other Picasso sets. If your child is into building vehicles like cars and trains, then you may also want to look into purchasing the car base that can be used with this set. If your child is more into other creations, then you can help them design an impressive sized castle or a towering dinosaur. There are endless possibilities, especially if you take advantage of the fact that multiple sets can connect together. These building tiles are a great way to help your child differentiate between different colors. This set has five different color options, which are red, blue, purple, green, and orange. Building with these blocks can also help your child learn their shapes. There are both squares and triangles included in this tile building block set, both of which come in several different size options. The Picasso building set comes with four large squares, which are all six inches by six inches in size. There are 24 small squares as well that are about half the size, which means that they are three inches by three inches. In addition, there are three different sized triangles. The first type is a tall triangle that will be great for roofs and tower tops. The set comes with six of these that are three inches by five and a half inches each. The next smallest triangle comes in a three by four size. There are eight of these types of triangles. The smallest of the triangles comes in a size that measures three inches by three inches, and there are 18 of these small pieces in each set. Playmags is a company that is dedicated to creating quality high quality building materials for school-aged children. 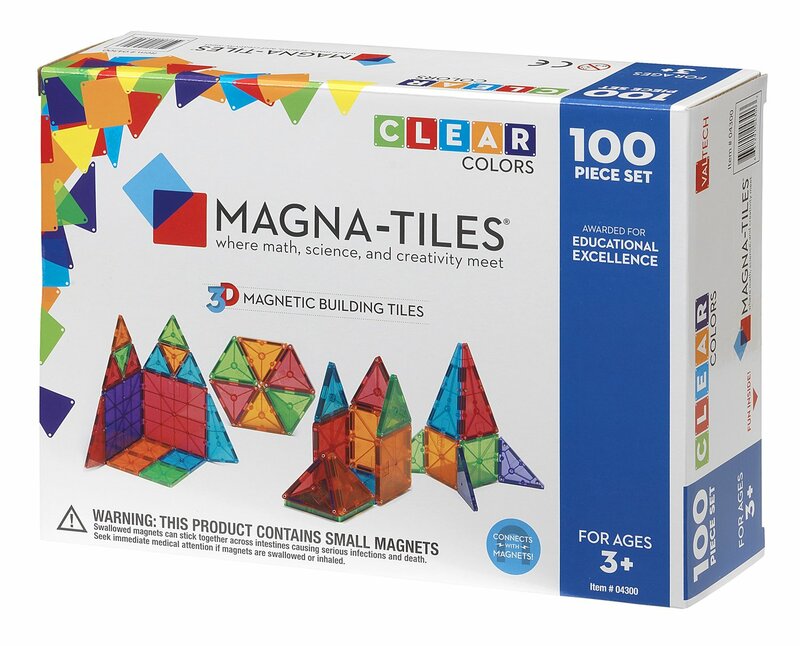 Their deluxe building set features clear magnetic tiles that are designed to create an alternative way for children to learn aspects of math, science, and geometry that they will use as they grow into adulthood. This tile building block set is designed for children who are two years of age. There are no real small parts or connections, so young children will not be in any danger of swallowing small objects. Once a child begins playing with these tiles, it is quite possible that they will continue to enjoy them through adulthood, when they begin to build innovative creations with their own children. This set includes 100 pieces that differ greatly in size and shape. There are eight different size varieties as well as six different color variations. That means that your child will have endless options to create two dimensional and three dimensional objects that they can be proud of, which could include castles, pyramids, and high towers that are almost as tall as them. The variety of colors and shapes are great for helping your child develop their young brains. Shape and pattern recognition is an extremely important skill that your child will need to develop. There is no better way to help your child learn what they need to at this age than to give them toys that will help their minds sharpen while they are enjoying themselves and having fun. This set is designed to be a durable point of entertainment that will not break when it suffers from abuse from children. 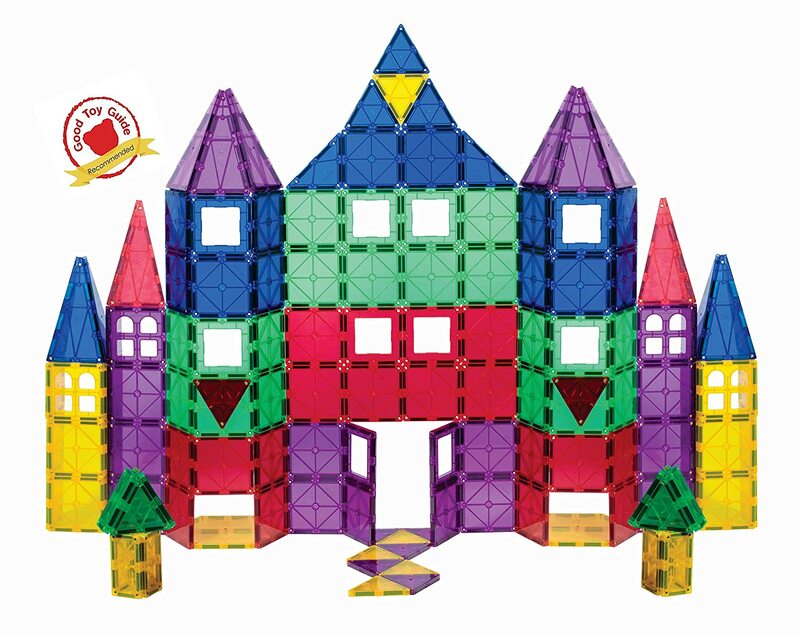 There are 18 triangle shaped pieces and 32 square shaped ones, so your child will have plenty of pieces to connect to create walls or other aspects that they wish to bring to life. There are also four large square shaped pieces, eight long triangles, 12 equilateral triangles, and ten rectangle shaped pieces. In addition to these typical pieces, there is also a car base that is included for when your child wants to build a car, train, or other vehicle. There are also 15 windows included in the set, which is a great addition for those kids who love building structures such as houses. Our Bronze Pick is from the iconic magnetic building block brand Magna Tiles. Developed by Valtech, these bricks feature all of the capability to expand your creative spark into the realm of the three dimensional. Valtech’s commitment to the Magna Tile brand reflects their well-established history of creating a wide variety of products that serve as educational tools for the next generation of adults. These blocks incorporate several key features that serve as a full experience for anyone who wants to build. Designed as a means to help develop not only a sense of creativity, but also math, science, tactile and spatial skills, these blocks come in a variety of shapes and sizes that trains the brain for the future. In the box, Valtech has included four large square blocks, 11 right triangle blocks, 20 equilateral triangle blocks, 50 small square blocks, and 15 isosceles triangle blocks. Each of these blocks can be used in conjunction with others in other to form a plethora of more irregular shapes like hexagons, diamonds, stars, and trapezoids. As your child builds, so does his or her awareness of geometrical design. This knowledge is so useful that it can even be applied to the careers of future 3D modelers. Magna Tiles are flat and feature very few surface differentials; as a result, they are incredibly easy to clean and store. Everyone who’s lived in a house where kids like to play with Lego blocks knows the pain of stepping on one with bare feet. Since these blocks are flat, this is a problem that you won’t experience with Magna Tiles. Amazingly, these are also incredibly hard to scratch, and if they do get a nick or two, the damage doesn’t show up on the translucent surface of the bricks. 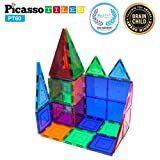 There are over 1400 reviews on Amazon for this 100 piece Magna Tile set, and of this large amount of online purchases, an unbelievable 98 percent satisfaction rate has been attained. The split of four stars and five star ratings amounts to a 92 percent of the reviews garnering a five star rating and another six percent at the four star rating level. The general consensus from these five star reviewers is that Magna Tiles are durable, easy to use, and fun for everyone, including adults. Expense should never be a ceiling for creativity. If you are working under budgetary constraints there are certainly options for you if you’re looking for a magnetically interlocking building block set. Our ballin’ on a budget pick is a great option if you intend to buy a starter set for your children and want to test the waters for their level of interest in toy set design. This option is also a great pick for kids who you know love to play with building blocks. Developed by Magnetic Stick N Stack these blocks were developed to fulfill a specific need that has been often felt by building block enthusiasts. A pair of married toy developers, simply known as Jack and Julie, had noticed that their children had limiting factors when they were playing with their magnetic building block sets. The couple realized that while you can certainly exercise your imagination with these types of sets, there were several missing components such as archways, windows, and rounded edges. When attending a Chinese toy trade show, they saw an opportunity to add diversity to this genre of toy making and the rest is history. Magnetic Stick N Stacks are designed to be compatible with all magnetic interlocking toy sets. As a result of the founders’ vision, the chief difference is that the company provides many useful accompaniment blocks for a broader creation experience. With this set you’ll notice paned blocks that can be used to create windows on your castle, or even be used to make cool looking crates that accompany a magnetic block created cargo ship. The set includes 60 tiles, with four of these types of windows. Color options are relatively sparse though, with only red, blue, green, and yellow available from this particular set. This is also an award winning product. Magnetic Stick N Stack was awarded both the Tillywig Toy Award as well as the PTPA (parent tested, parent approved) award. Coming from such an innovative start, this magnetic building block series is a great example of toymakers finding a way to improve the overall enjoyment of building block enthusiasts. A box of magnetic building blocks can come in a bunch of different piece options. Some sets come with 60 pieces while others come in packs that offer 100 or more different pieces. Some boxes come with unique bases that allow your child to use their imagination more constructively and build a train or a space station. Others may only have the traditional block tiles that typically vary in size and shape. Decide how many pieces you will want to purchase for your child to play with. Remember that you can always purchase multiple building block sets to give your children more to work with, but make sure that you have ample space in their playroom to store all of the tiles. Dependent on who’s going to be using these types of magnetic building blocks, you’ll want to be sure that your set can take a couple of hard licks before falling to pieces. Children tend to be rougher on these types of toys than toy collection enthusiasts, so be sure that if you intend to purchase these for young ones, they snap securely and don’t accumulate scratches on their plastic surfaces too easily. If you’re simply a collector who wishes to build multicolored grand-scale castles, durability may not be as much of a consideration for you. In any situation, a little extra sturdiness never hurt anyone, and having magnetically interlocking bricks like these could always use a little bit of scratch resistance if calamity occurs. As all of the types of bricks we’ve talked about in our write up are magnetically connecting, you’ll have your pick of the litter when it comes to the types of tiles that you’ll want for your building purposes. Each brand does have its own specific brick shapes and connection systems, so if you do pick a brand that has various form factored triangles and squares, it most likely won’t be compatible with another brand’s bricks. When you’re trying to select a new set of magnetic building block tiles, be sure that you pick the brand that has the types of tiles that best fits your own creative style. When your child is building something with different shapes and styles of building blocks, it gives them more of an opportunity to be creative. Different building blocks are designed for different aged kids. 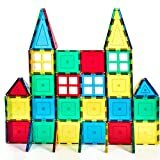 Larger blocks are designed for toddlers, but these magnetic style building blocks are more often built for preschool-aged children who are over the age of three. Some sets have tiny connecting pieces that may be hazardous for small children, so make sure that you choose a set that is appropriate for your child’s age. Also, consider the sharpness of the tiles that you are purchasing. Many of the magnetic style of building block tiles are designed in different colors. They vary greatly so that they are appropriately colored for both young boys and girls. Some of the tile sets are designed with neutral color options such as red, yellow, orange, and rainbow variations. Others are more blue and green for boys to enjoy, and certain block sets utilize pink and purple tiles, which is designed to attract girls and encourage them to enjoy building blocks. As you can see by our list of pre-purchased considerations, there are a myriad of different building block options for small children. They vary in size, shape, color, and design, so you can have a million of different combinations that can be expressed with your child’s imagination. Take a look at the picks on our list to decide which features are the most important to you. You can also involve your child in the process of deciding which magnetic building blocks will entertain them the best while keeping them safe at the same time. Once you find a set that is perfect, stick to that connection type so that it is possible to purchase additional tiles to replace and add to your current set. Your child will love creating the endless possibilities that are available to them.